The labrum cushions the head of the humerus and holds it securely to the glenoid, stabilizing the joint. 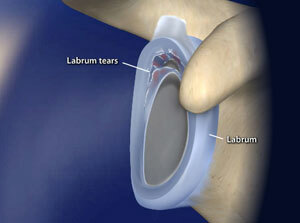 The labrum acts as a bumper to help keep the ball in the socket. This animation describes labral tears in general. Labral tears can occur in different locations around the shoulder socket. A labral tear at the top of the socket is called a SLAP tear. The animation on SLAP tear can help explain this type of labral tear further. A labral tear can also occur to the back part of the socket. A labral tear that occurs in the lower portion of the front of the socket is called a bankart tear. This type of tear is explained further in the procedure animation video labeled bankart repair. Tears can be located either above (superior) or below (inferior) the middle of the glenoid socket. A SLAP lesion (superior labrum, anterior [front] to posterior [back]) is a tear of the rim above the middle of the socket that may also involve the biceps tendon.